I was a VERY picky child. Every day in fourth grade, I ate a bag of fritos, a cup of chocolate-vanilla pudding, and a Polly-O cheese stick for lunch. My grandfather was certain I was going to get scurvy. My dinners consisted of plain white pasta with butter, or chicken fingers and ketchup. My brother had the same tendencies: he ate a plain, untoasted bagel with three strips of bacon every day for breakfast for five years. Try taking us out for dinner. Good luck. In the past few years, I’ve tried dozens of new foods. Now that I am in my twenties, my picky ways are gone and my love of food has arrived. Sure, some of the things I’ve tried don’t pass the lips of most people until they’re adults, like balsamic vinegar, or beets. But other things are so basic! For example, I had bacon for the first time at 18, and cherries for the first time last year. 15. Kale! 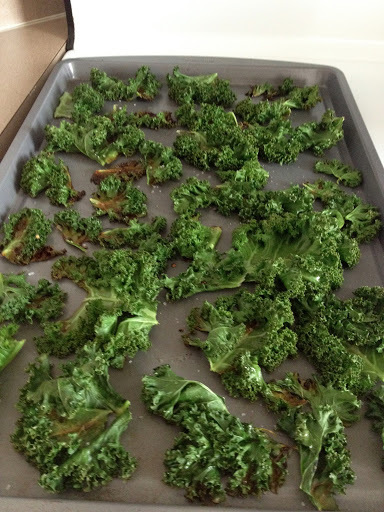 Especially homemade kale chips. How many of these things do you love? Looking over this list, it seems a little crazy that I was so reluctant to try new things my whole life! If you haven’t tried something, try it!